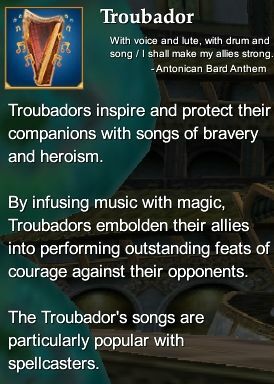 From the Everquest 2 player manual: "The Troubador is ideal for those who desire to inspire and protect their allies through the unique magic generated by their songs of bravery and heroism. The Troubador best serves their party from behind the front lines of combat. Through their music, the Troubador inspires allies to perform outstanding feats of skill and courage. The Troubador may also use their songs to demoralize it's enemies." Troubador Epic Weapon Series (80) - Rise of Kunark Troubador Epic Weapon. This page last modified 2011-08-25 22:51:51.